Deal to sign the Brazil international collapsed at the last minute after he changed his mind. United were set to pay his €190m release clause after Neymar's camp had agreed personal terms. Neymar may be on the brink of completing his world-record move to Paris Saint-Germain from Barcelona - but it could have been a whole different story for the Brazil international. A sudden U-turn last summer saw him decide against a move to Manchester United, after the club had agreed personal terms to sign the superstar forward. French publication L'Equipe understand that Jose Mourinho's side were ready to pay the release clause for Neymar, which then stood at €190m [£170m] to bring the now 25-year-old to Old Trafford. But at the 11th hour the ex-Santos star changed his mind and opted to remain at the Nou Camp for another year. United would later that same summer break the world transfer record by signing France international Paul Pogba from Juventus in a deal worth £89m, eclipsing the fee which took Gareth Bale to Real Madrid. The Independent understand however that the 20-time English league champions were never interested in reigniting their interest in Neymar this summer due to a number of factors. Meanwhile, there is also no evidence a move for Neymar this summer would have been backed by the Glazer family, with the owners having financed the huge deal for Pogba 12 months earlier. The collapse of deals for the likes of Inter Milan's Ivan Perisic and new Chelsea forward Alvaro Morata has highlighted how transfer funds have been reduced, with Mourinho having regularly voiced his displeasure at the delay over the completion of new signings. PSG do not expect Neymar to change his mind for a second time ahead of completing a deal which is likely to be worth €500m [£450m] in total. The Ligue 1 giants will activate his release clause of €222m [£198m] and will pay the player €30m-a-year [£26.8m] after tax, according to The Guardian. 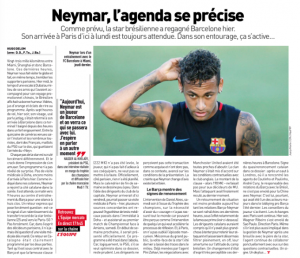 Neymar was on Wednesday [2 August] given permission to miss Barcelona training to begin formal discussions with PSG, after asking to end his four-year association with the Catalan giants. Central to Neymar's desire to leave is his ambition of becoming the world footballer of the year, which he feels is unrealistic in the shadow of Barca's posterboy Lionel Messi. Indeed, Neymar would also have struggled to have wrestled the spotlight away from Pogba at United. Messi has led the tributes to Neymar, who won eight major trophies and scored 105 goals in 186 appearances during four seasons at the club, after he told teammates he was leaving Barcelona. "It was an enormous pleasure to have shared these years with you Neymar, friend," the five-time Ballon d'Or winner stated. "I wish you a lot of luck in the next stage of your life. See you."